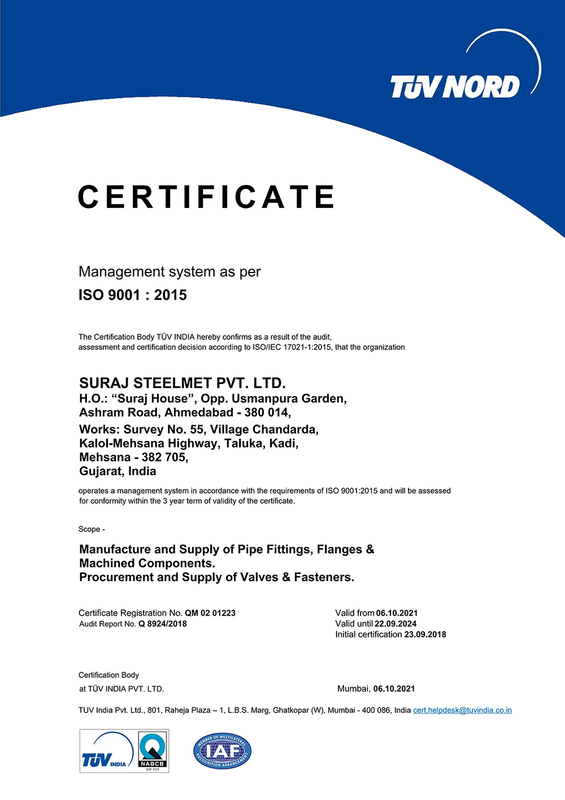 Suraj Steelmet pledge to adhere to ISO 9001:2015 quality standards continually in a methodical manner. We are the certified supplier of piping solution products. Every stage is a testing stage in our Supplier unit. To ensure pre-determined quality in the finally released product mandatory assessments are performed. We follow a systematic flow of operations throughout to maintain our client’s trust in us. They have been able to rely on us because we always keep our said words. Right from beginning to the released consignment we follow distinctive, effective, and well-structured approach. We lead the way with the unceasing efforts to achieve excellence. Dedicated team and sound infrastructure helps us secure desired quality at slashed rates. To maintain high quality standards we scrutinise raw materials and generate quality test reports to keep everything in check. We as a family and an expert team respect each other and our work. We are able to improve and grow continually because we value every teammate’s effort and motivate them to do better. Thus, we raise both internal and external standards. The quality assurance system is guided by the work culture we follow. Through combination of versatility and consistency we have acquired excellence in our vertical. We focus on extending quality bars with grit and unmatchable efforts keeping amount figures in consideration. Appropriate quality check measures have been incorporated to ensure correctness at each step of the cycle. We strive for deep understanding of consumer's needs and show creativity accordingly. We give value to our client's spendings in form of quality products & services. We believe that having open, transparent & frequent communication helps foster trust and build loyalty. Poor quality components can refrain an industry from growing. So, we go extra miles for our clients to be a star performer in their respective fields.